England et al. (2014) paper Recent intensification of wind-driven circulation in the Pacific and the ongoing warming hiatus has been getting a lot of press around the blogosphere. The HockeySchtick has an excellent overview here, Anthony Watts introduced the paper in his WattsUpWithThat post here, Jo Nova has a guest post by William Kininmonth here, and Dana Nuccitelli added the warmist spin on the paper for SkepticalScience here. The following are a few quick comments about England et al. (2014). The England et al. (2014) paper appears, in many respects, to be a continuation of Meehl et al. (2013), which we discussed here. England et al (2014) are defining the multidecadal variability of El Niño and La Niña dominance with the abstract metric called the Interdecadal Pacific Oscillation. See the post linked in this paragraph for more information about the Interdecadal Pacific Oscillation. It seems odd that these papers use abstract forms of sea surface temperature data as proxies for multidecadal variations in ENSO. The terms ENSO, El Niño and La Niña do not appear in the abstract of England et al. (2014). Why? 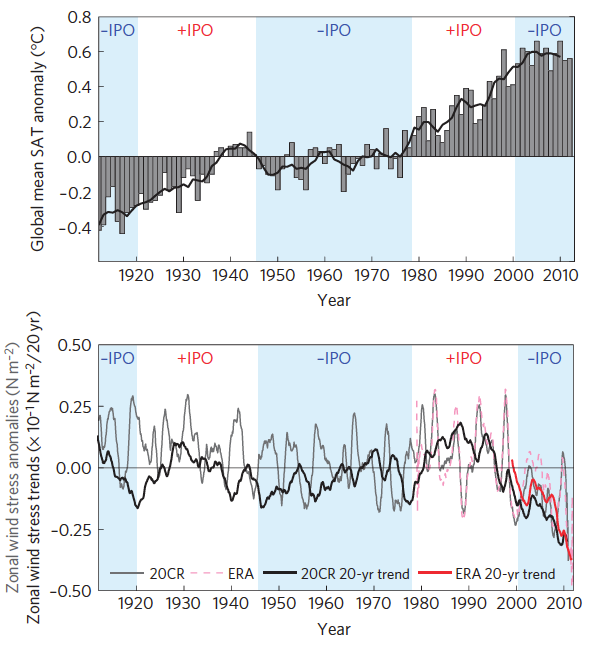 The Interdecadal Pacific Oscillation is primarily an aftereffect of ENSO. Much of England et al. (2014) was devoted to climate models and how the models did not properly simulate the recent stronger trade winds experienced in tropical Pacific—stronger trade winds that were due to the dominance of La Niñas. When England et al. forced the models with trade wind data, which vary in response to El Niño and La Niña events, then the modeled rate of surface warming declined. Obviously, the climate models used by the IPCC will have to be able to simulate basic ENSO processes if the models are to have any value at predicting future climate on multidecadal bases. Phrased another way, England et al. (2014) admit that the climate models used by the IPCC for the 5th Assessment report (the CMIP5 models) failed to capture one of the aspects that can cause surface temperatures to stop warming—a dominance of La Niña conditions. They’re obviously implying that a dominance of El Niño conditions (like we experience from 1976 to 1998) contributed to the warming. They’re also implying that the projections of future climate by the CMIP5 models are basically worthless because the models cannot simulate the multidecadal variations in El Niño and La Niña dominance, which cause surface temperatures to warm (during periods of El Niño dominance) or to not warm (during periods of La Niña dominance). Guilyardi et al. (2009) and Bellenger et al (2013) were very critical of how climate models simulated the processes of ENSO. We’ve referenced those papers in numerous posts over the past year, most recently in Our Climate Models Are Aglow with Whirling, Transient Nodes of Thought Careening through a Cosmic Vapor of Invention. We discussed ocean heat uptake in the recent Open Letter to Kevin Trenberth – NCAR. While the ocean heat content of the western tropical Pacific has increased since 1999, on the other hand, in the eastern tropical Pacific, ocean heat has decreased, resulting in a net decline in ocean heat content for the entire tropical Pacific in that time. In that same Trenberth post, we showed that the subsurface temperatures for the entire Pacific to depths of 2000 meters showed little warming, and that the warming to depth was occurring in the South Atlantic and Indian Oceans only. This appears to contradict the model-based findings of England et al. (2014). England et al. (2014) show the outputs of reanalyses of wind stress anomalies in the bottom cell of their Figure 1. The wind stress anomalies are for the region bordered by the coordinates of 6S-6N, 180-150W. As you’ll recall, a reanalysis is the output of a computer model. It is not data. Data are used as inputs to reanalysis. Unfortunately, there is little source wind data for the eastern equatorial prior to the 1960s. Thus the need for England et al. to rely on reanalyses. The satellite era started the late 1970s, so before then, there is poor sampling of wind stress anomalies. ICOADS is the source of wind data for the oceans. Animation 1 presents maps of the “u” (east-west) zonal component for the Januaries 1910, 1920…through 2010, based on the ICOADS database. As shown, there is little wind data for the equatorial Pacific prior to the 1960s. You can see the ship tracks in the early maps, so the data are based only on readings taken as the ships sailed across the region, sometime during the month. How would England et al (2014) know if recent trade wind strength was “unprecedented” when there is little real data to support such a claim? Global surface temperatures are dependent on the annual, multiyear, decadal and multidecadal variations in sea surface temperatures. And sea surface temperatures, of course, depend on coupled ocean-atmosphere processes that cannot be simulated by climate models. If and when the climate models used by the IPCC are able to properly simulate the multidecadal variations in those couple ocean-atmosphere processes, the climate models may be useful in projecting future climate; until that time, climate models are not fit for purpose…plain and simple. This entry was posted in Climate Model Failings, Climate Model Problems, El Nino-La Nina Processes. Bookmark the permalink. Informative as always Bob. Thanks. Since I’ve been reading your eBooks it didn’t take me long to reach the same conclusion about this ‘paper’, albeit not as eloquently expressed as above. It was a wonder to me that they never acknowledged the existence of the ENSO nor did they really offer an explanation for what caused the ‘unprecedented’ strength of the Trade Winds. If you don’t know why they increased (if, in fact, they did) then how could you just blithely assume that they will, at some point in the future, decrease back to ‘normal’ levels (not that there is any evidence presented to establish that Trade Wind strength prior to the satellite era was ‘normal’. What if Trade Wind Strength prior to the satellite era was unprecedentedly weak (by historical standards) and the current ‘strength’ is ‘normal’? England et al. (2014) is an attempt to make ENSO disappear, to replace a fundamental cause of the Earth’s climate with some its effects. Not surprisingly, it is some some sort of hockey stick for the oceans. This post emphasizes again the inutility of the IPCC models for climate forecasting. It is time for the climate community to move to another approach based on pattern recognition in the temperature and driver data and also on the recognition of the different frequencies of different regional weather patterns on a cooling ( more meridional jet stream ) and warming (more latitudinal jet stream ) world. What we are seeing here is the ground work for a full court press during the next El Nino. Just like Myan priests predicting an eclipse the scientists are predicting something that they know is going to happen and giving it supernatural significance. Thanks Bob. I suspect the England et al paper will die a death when the next big bright idea comes along. Ho hum, just another day in the heat mine. If England et al use the “unprecedented” trade winds to explain the pause, they must surely be comparing pause (1998-2014) years to pre-pause (1977-1998) – and there are adequeat records for both these periods. So why resort to reanalyses at all? And surely they could have flipped the axes on the 2nd chart to get a nice hocket stick? That’s just lazy! Clearly they can’t -that’s a travesty!- and therewith these model outputs are over-predictions, and plain wrong. Bob, good summary, the paucity of information in animation 1 is very revealing and deserves more publicity. And, Tom, this is my fear also, they think that they are on a winner and will crow about air warming when El Nino finally appears; we are going to need Bob’s analysis more and more to refute their claims. Thanks Bob – good work as usual. A question for you? If the temperature of some oceans is warming whilst others are cooling would a larger temperature differential between the oceans lead to more extreme weather, cyclones, flooding etc. and a lesser temperature differential less extreme weather? I find it interesting that Australia is experiencing near record warm temperatures whilst North America is experiencing record cold and the UK flooding!! Tanner, I don’t know enough about what causes weather extremes to answer your questions. Thanks for the link, Andy. It’s par for that course. Lake Erie, Huron, and Superior are frozen. Lake Michigan might be making a historical total freeze over but I think the data is being obfuscated/manipulated/minimized. It is looking like Sunday or Monday might be maximum ice cover on Lake Michigan as a warm streak is FINALLY coming. Maybe some of you are more privy to the longer term weather … BUT my point is it sure would be nice for someone to fly over the part of Lake Michigan they will likely be saying is not frozen. I think you would find they are under reporting ice coverage … and this would be tangible “catching them with their hand in the cookie jar” type scenario with erroneous, biased data. I mean, what do their percentages of ice coverage really mean … very questionable, arbitrary, and easily manipulated.